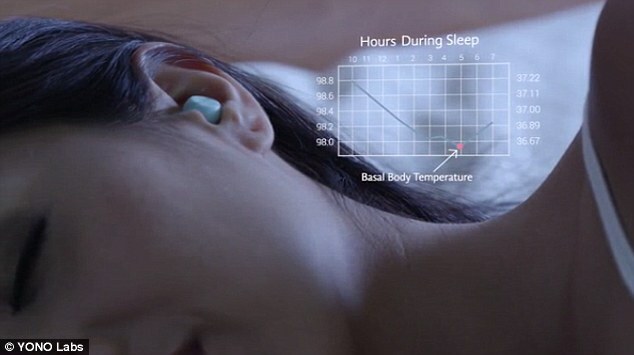 Engineers have created earphones that they say could help women get pregnant. Known as Yono, the in-ear wearable is designed to help track ovulation cycles, so that women can find out when they are at their most fertile. Its creators say the device is more accurate and convenient to use than existing ovulation tracking systems. The Yono device can monitor a woman’s basal body temperature, or BBT, which increases slightly in the days before a woman is more fertile. BBT thermometers are available, but they can be difficult and inconvenient to use. A basal thermometer will register tiny temperature variations, but it needs to be used regularly at the same time every day, usually in the moments after waking up. The Yono in-ear device, meanwhile, measures its owners temperature up to 70 times per night. Women who want to have a big family should start trying for a baby by 23, experts have warned. Even those who only want one child shouldn’t wait past the age of 32, if they really want to become a mother. The advice comes from scientists who crunched together fertility data on more than 58,000 women to create an at-a-glance calculator. It tells a woman the best age to start a family – and makes it clear that IVF is not a guarantee for those who wait. British experts said that the table is so useful that it should be shown to sixth formers and university students to underline the risks of delaying motherhood. Professor Allan Pacey, a Sheffield University fertility expert, said: ‘We haven’ t got a time machine we can put people in….that’s just a blunt reality. It then uses Bluetooth to send the data to the Yono app in the morning, which analyses the figures and provides an ideal window for fertility. The Yono design was created by Vanessa Xi, a Stanford University graduate. When Xi was trying to conceive, her doctor asked her to measure BBT data daily. She found that even for the most disciplined women, it’s difficult to finish one month’s data measuring, recording, and plotting. A Kickstarter campaign to commercialise the technology runs through September 17, and it has already raised $20,250 towards its $30,000 goal. The company is expected to ship its device, which currently costs $99 (£64) in December.